King County monitors the ecological health of the Green-Duwamish River in a variety of ways, including collecting and analyzing water, sediment, and benthic invertebrate samples. King County has been conducting monthly baseline water quality monitoring at several sites along the Green-Duwamish River beginning in the early 1970s. Duwamish River - Station 0309 was located in the Duwamish River at the bridge on East Marginal Way in Allentown. Sampling at this site began in 1970 and continued until 2008 when budget cutbacks forced King County to reduce the breadth of its water quality monitoring program. The County sampled two additional stations (0305 and 0307) further downstream on the Duwamish River until 2004. All of these downstream sites are influenced by tidal water and therefore are no longer included with the other streams in freshwater assessments. Lower Green River - Two stations are located in the Lower Green River. Station 3106 is located at the bridge at Fort Dent Park downstream of the former Renton Treatment Plant outfall. Sampling at this site began in 1970 and continues today. Station 0311 is located a few hundred yards upstream from the former outfall at the Renton Junction Bridge on West Valley Road at Highway 1. Sampling at this site began in 1970, but was discontinued in 2008 due to budget cutbacks. Station 0311 was added back to the monitoring program in 2014. Middle Green River - There are two stations located in the Middle Green River. Station A319 is located upstream of the confluence of Soos Creek at the bridge on Black Diamond Road. Sampling at this site began in 1976 and continued until 2008 because of budget cutbacks. Station A319 was added back to the monitoring program in 2014. Station B319 is located upstream of the confluence of Newaukum Creek at the bridge on Southeast Green Valley Road. Water quality sampling at this site began in 1972 and continues today. From time to time, additional studies have been conducted in the Green-Duwamish River watershed. Click here for more information about Special Studies. The Green-Duwamish River watershed is located in southern King County and is the largest freshwater component in the Water Resources Inventory Area (WRIA) 9. The river flows for over 93 miles beginning at the crest of the Cascade Mountains and ending as it empties into Elliott Bay (Herrera, 2005; Kerwin and Nelson, 2000). 1851: European settlement begins in the Duwamish River. 1880 - 1910: Logging occurs across much of the watershed and in the lower river valley; agricultural land use expands. 1911: White River is diverted from Green River to Puyallup River for flood control, reducing watershed area by 30 percent. 1913: City of Tacoma, Washington begins diverting water from Green River to provide water for homes and industry. Anadromous salmonids are blocked from Upper Green River Sub-watershed. 1916: Black and Cedar Rivers are diverted from Duwamish River to Lake Washington to improve navigation, further reducing watershed area by 40 percent from its original size. 1900 - 1940: Duwamish estuary tidelands are filled, drained and dredged to support growing industrial and port activities. 1895 - 1980: The Green/Duwamish River is channelized and diked for navigation and flood control. 1945 - 2000: Residential, commercial, and industrial land uses expand, largely replacing farmlands and forests in the western half of the WRIA. 1962: Howard Hanson Dam is completed for flood control purposes. The Green-Duwamish River watershed as it is today can be divided into four subwatersheds. The Green-Duwamish Estuary from the River Mile (RM) 0.0 at Elliot Bay/Harbor Island to RM 11.0 at Tukwila covers 14,080 acres. The Lower Green River from RM 11.0 at Tukwila to RM 32.0 at Auburn Narrows covers 40,832 acres. The Middle Green River from RM 32.0 at Auburn Narrows to RM 64.5 at the Howard Hanson Dam covers 113,600 acres. And the Upper Green River from RM 64.5 at the Howard Hanson Dam to the headwaters covers 140,608 acres. Land use varies considerably throughout the length of the Green-Duwamish River watershed (Kerwin and Nelson, 2000). Land in the Upper Green River sub-watershed is almost entirely used for public and private forest production. The Middle Green sub-watershed is a mix of residential, commercial forestry, and agricultural land uses. The Lower Green River Sub-watershed is characterized as residential, industrial, and commercial land uses. And, the Green-Duwamish Estuary sub-watershed is split between residential and industrial uses. In total, the watershed (not including the Green-Duwamish Estuary) is a mix of forest (mostly evergreen), developed land, and scrub. Agriculture, wetlands, and other (barren land, grassland, and open water) account for a little less than 10% of total land use. See Table 1 below for more details on land use. For more detailed information about the Green-Duwamish River watershed, please visit the Green River webpage. Anadromous salmonids found in the Green-Duwamish watershed are coho, Chinook, chum, sockeye, and pink salmon and coastal cutthroat, steelhead, and bull trout/Dolly Varden char (Kerwin and Nelson, 2000). Non-native Atlantic salmon have recently been found in the watershed as well. Compared to other freshwater systems of Puget Sound, the Green River has not experienced the same level of decline in the naturally spawning adult chinook. There are several reports that include comprehensive information about the fisheries and ecosystems of the Green-Duwamish River. More information about habitat protection and restoration and the recovery of salmon species in the Green-Duwamish basin can be found at the Green River webpage. In addition, volunteers with the Salmon Watcher Program made observations at various locations within the Green-Duwamish River basin from 1997 to 2015. State water quality standards were revised in 2003. The Duwamish River is now categorized as “Salmonid Rearing and Migration Only Habitat”, the Lower Green as “Salmonid Spawning, Rearing, and Migration Habitat”, and the Middle Green as “Core Summer Salmonid Habitat” for aquatic life use. As part of the updated water quality standards, portions of the Middle Green River has been assigned an additional “Supplemental Spawning and Incubation Protection” temperature criteria of 17.5 ºC to be applied from September 15th to July 1st. For recreational use, the Duwamish is designated as “Secondary Contact” and the Lower/Middle Green as “Primary Contact”. The Duwamish Waterway and River is on the Washington State Department of Ecology’s (Ecology) 303(d) list for not meeting DO standards (Category 5). The Green River has an EPA-approved Green River Temperature Watershed total maximum daily load (TMDL) plan in place and implemented for DO (Category 4a). A 25-year (1979 – 2004) trend analysis was conducted with baseflow water quality data from the three upstream sampling locations (0311, A319, and B319) showed some significant changes in the water quality since 1979. Results show that there has been a significant decrease in DO, pH, and ortho-phosphorus at all three stations. Total suspended solids decreased significantly at station A319 and B319, and turbidity decreased significantly at station B319. FC bacteria decreased significantly at stations 0311 and A319. Temperature increased significantly at station 0311 over this time period. Total phosphorus increased significantly at B319. For information about how water quality trends compare to other County streams, please visit the links above. A Water Quality Index (WQI) rating system was developed by Ecology that evaluates several water quality parameters and gives a single rating of “high,” “moderate,” or “low” water quality concern. 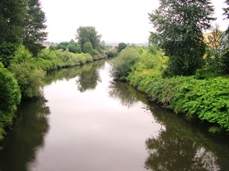 To see how the Green-Duwamish River ratings compare to the other sites in the County monitoring program, please visit the Water Quality Index webpage. King County does not maintain stream gages on the mainstem of the Green-Duwamish River. The U.S. Geological Survey (USGS) does operate five stream gages on the Green River: at the Howard A. Hansen Dam (12105900), at the purification plant near Palmer, WA (12106700), near Auburn, WA (12113000), near Kent, WA (12113344), and at Tukwila, WA (12113350). King County operates three water temperature sensors on the Green River: at the Whitney Bridge (GRT 10), at the Interurban Ave. Bridge near Fort Dent (GRT 40), and the 42nd Ave Bridge near the Tukwila Community Center (GRT 41). Four samples were collected along the Green River reach in 2010. The most upstream site is located at Flaming Geyser State Park (FG319) and the most downstream site is located at the Foster Links Golf Course downstream of the Black River confluence (FL319). Results indicate that Green River sediments did not exceed any sediment quality guidelines; however, there was difficulty collecting fine sediments at these sites and a large percentage of the particle size was sand (>80% on average). Total organic carbon (TOC) was also particularly low at these sites (average of 0.75% TOC). Benthic macroinvertebrates are small animals visible to the naked eye (macro) that lack a backbone (invertebrate) and live in or around the streambed (benthic). This group includes aquatic insects (such as mayflies and dragonflies),crustaceans, clams, snails, and worms. Benthic macroinvertebrates are of interest to scientists and water resource managers because they are an excellent indicator of the biological health of stream ecosystems and are a critical component of the food web in aquatic communities. Scientists quantify the composition and diversity of benthic macroinvertebrate populations in a stream to compare the biologic integrity of different streams. King County has utilized benthic macroinvertebrate sampling to assess biological health of numerous creeks across the county (see map). For more information about benthic macroinvertebrates and King County’s Benthic Macroinvertebrate Program, please visit the King County Stream Bug Monitoring webpage. To see the benthic macroinvertebrate data for tributaries of the Green River, please visit the Puget Sound Stream Benthos webpage. In collaboration with the City of Seattle, the University of Washington Green Futures Lab, and the Bullitt Foundation, King County is working to improve the conditions of the Green-Duwamish watershed, a network of rivers, uplands, and habitat stretching from the Cascades and Elliott Bay. Strategies include managing habitat restoration, salmon recovery, flood control, public health, and economic development. The project also includes reducing upstream pollution, such as stormwater runoff. The watershed is a socially and economically important part of the region and historic pollution has degraded the system. Sheppard, Ryan, and Blahna (2017) characterized civic environmental stewardship and evaluated ecological monitoring activities in the Green-Duwamish watershed. The study found that restoration programs were the most common forms of environmental stewardship throughout the lower and middle watershed. The study also found that stewardship was influenced by population density, political boundaries, and financial and technical resources. Overall, monitoring efforts are "unevenly distributed and unsystematic" (Sheppard, Ryan, & Blahna, 2017). Suggestion for improving stewardship efforts are included. Due to human activity and land use change in the last 150 years, riparian habitat in the Green/Duwamish River and WRIA 9 have decreased dramatically. Riparian habitat, specifically tall native trees, are necessary for salmon, such as Chinook. Without trees, conditions can be unhealthy and sometimes lethal for fish. Tall trees along a 165-foot swath will provide the most benefits in terms of habitat, water temperature, and water quality. This study provides a strategy for allocating funds and grants and developing a plan to restore habitat. Following several projects on salmon recovery in WRIA 9, this study sampled fish from various habitats to evaluate juvenile salmonid use of the Lower Green River. Results suggested that increasing the amount of high quality habitat for juvenile Chinook salmon to reach parr size would likely increase adult returns and ultimately support salmon recovery. For more information on the Green-Duwamish River, please visit the Green-Duwamish River Watershed webpage.